A family of Toll-like receptors (TLRs)4 senses invasion of microorganisms by recognizing specific patterns of microbial components and triggers activation of innate immunity (1, 2, 3). The TLR family harbors an extracellular leucine-rich repeat domain and a cytoplasmic domain (Toll/IL-1 receptor (TIR) domain) that is homologous to that of the IL-1R family (2). 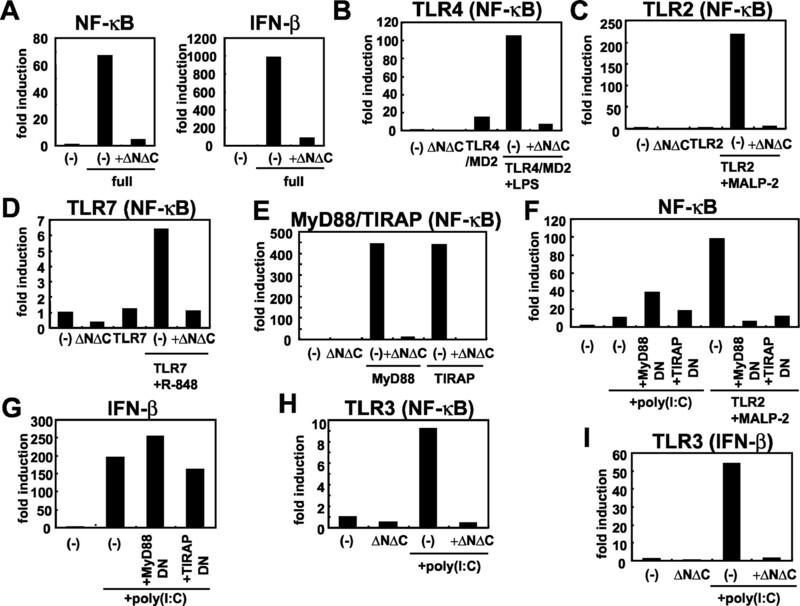 Analogous to the IL-1R, TLR recruits IL-1R-associated kinase via an adapter MyD88, and then induces activation of TNFR-associated factor 6 and finally NF-κB. TLR-mediated production of inflammatory cytokines is completely abrogated in MyD88-deficient cells. However, recent studies indicated that the signaling pathways through individual TLRs might differ from each other and thereby result in different biological responses (2). In fact, the TLR4 signaling contains MyD88-dependent and -independent pathways; the former is essential for cytokine production whereas the latter is involved in IFN regulatory factor (IRF)-3 activation and subsequent induction of IFN-β and IFN-inducible genes (4, 5, 6). The MyD88-independent pathway is also observed in TLR3 signaling (7). 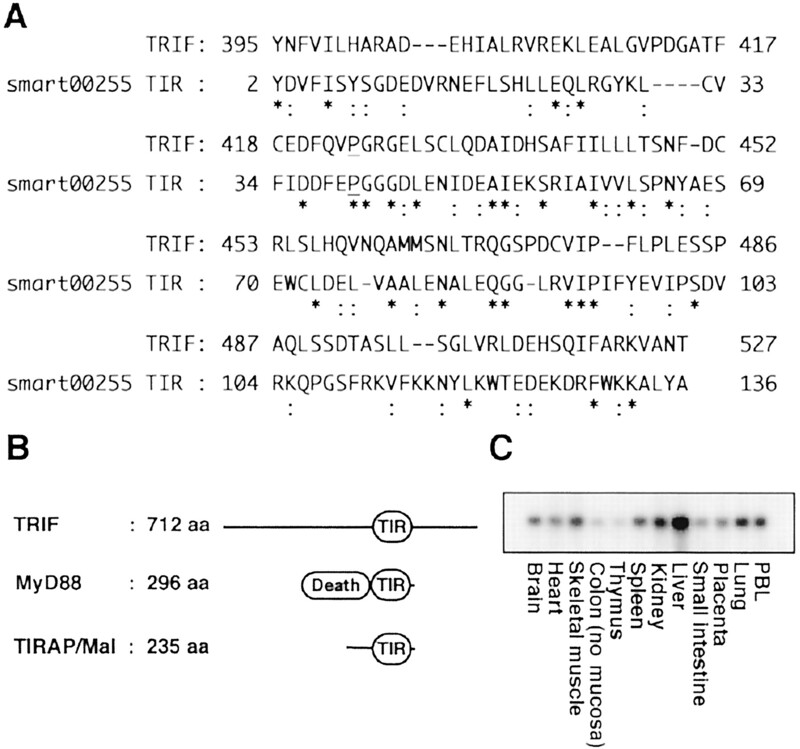 Recently, TIR domain-containing adapter protein (TIRAP)/MyD88 adapter-like (Mal) has been identified as a second adapter harboring the TIR domain (8, 9). In vitro studies indicated that TIRAP/Mal is involved in LPS-induced activation of the MyD88-independent pathway (7, 9). However, studies with TIRAP-deficient mice have revealed that TIRAP acts as an adapter in the MyD88-dependent signaling pathways via TLR2 and TLR4 (10). These studies suggest that several TIR domain-containing adapters are involved in the TLR-mediated signaling pathways and differential use of these adapters provides the specificity in the TLR signaling, and furthermore that the MyD88-independent signaling pathway is mediated by a molecule other than TIRAP. To further clarify the signaling pathways via TLRs, we searched for adapters containing the TIR domain besides MyD88 and TIRAP. The database screening led to identification of a novel adapter we named TIR domain-containing adapter inducing IFN-β (TRIF). Our present study shows that TRIF preferentially activates the promoter of the IFN-β, and a dominant-negative (DN) form of TRIF, but not MyD88 or TIRAP, blocked polyinosine-polycytidylic acid (poly(I:C))-mediated TLR3 response, indicating the specific role of this novel adapter in TLR3 signaling. 293 cells were transfected with Flag-tagged human TLR3 expression vector together with pCMV-neo. G418-resistant clones were screened for expression of TLR3 by Western blot. Two independently isolated clones that stably express TLR3 were used in some experiments. We used LPS from Salmonella minnesota Re 595 (Sigma-Aldrich, St. Louis, MO) and poly(I:C) (Amersham Pharmacia Biotech, Piscataway, NJ). Macrophage-activating lipopeptide (2 kDa; MALP-2) and R-848 were described previously (11, 12). The endothelial cell-leukocyte adhesion molecule (ELAM)-1 promoter-derived luciferase reporter plasmid (NF-κB luciferase reporter) was a kind gift from Dr. D. Golenbock. Murine IFN-β promoter luciferase reporter was generated by PCR as described previously (13). Expression vectors for human TLR2 and human TLR4 were kind gifts from Dr. R. Medzhitov. The Flag-tagged human TLR3 was cloned into pEF-BOS vector. DN MyD88 has a deletion of death domain and DN TIRAP contains a proline to histidine mutation at amino acid 125. An expression vector for TLR7 was as described previously (11). 293 cells were transiently transfected with reporter plasmids, together with the indicated expression vectors. Luciferase activity of total cell lysates was measured using Dual-luciferase reporter assay system (Promega, Madison, WI). The Renilla-luciferase reporter gene (50 ng) (Promega) was used as an internal control. 293 cells were transiently transfected with the indicated expression vectors. Cells were lysed, and then immunoprecipitated with anti-Flag Ab (Sigma-Aldrich), anti-Myc Ab (MBL, Nagoya, Japan), or anti-human IRF-3 Ab (Santa Cruz Biotechnology, Santa Cruz, CA). Immunoprecipitants were washed, separated on SDS-PAGE, and transferred onto membrane. The membrane was blotted with anti-Flag Ab or anti-Myc Ab (Santa Cruz Biotechnology). Endogenous IRF-3 was identified with anti-human IRF-3 Ab. Then, the Abs were detected by the ECL system (PerkinElmer Life Sciences, Boston, MA). We suspected that, besides MyD88 and TIRAP, molecules with the TIR domain are involved in the TLR-mediated signaling pathways. Therefore, we searched for sequences that contain the TIR domain in expressed sequence tag databases and identified a novel human partial cDNA clone (GenBank accession number BC009860). This gene showed high similarity with smart00255 TIR domain obtained from a National Center for Biotechnology Information conserved domain search (Fig. 1⇓A). Using this fragment as a probe, a full-length cDNA of this gene was isolated. This gene has a long open reading frame of 2136 bp that encodes 712 aa (Fig. 1⇓B). The nucleotide sequence is available from GenBank (accession number AB093555). The deduced amino acid sequence of this cDNA showed 48% identities and 57% similarities with the mouse cDNA clone of unknown function (accession number XM110244). We referred to this gene product as TRIF for TIR domain-containing adapter inducing IFN-β (see the next section for detail). The TIR domain of TRIF existed in the C-terminal side of this protein. The proline residue that is conserved among TLRs and essential for activation of the TLR-mediated signaling was observed (Fig. 1⇓A) (14, 15, 16). Expression of the TRIF transcript was analyzed by Northern hybridization (Fig. 1⇓C). The transcript was ubiquitously observed in all human tissues examined, among which the liver showed strong expression. Identification of TRIF that harbors the TIR domain. A, Alignment of the TIR domain of TRIF and smart00255 TIR domain from the National Center for Biotechnology Information conserved domain search. Asterisks indicate identical residues in both sequences, double dots indicate cognate amino acids, and underlining indicates the proline residue conserved among TLRs, MyD88, and TIRAP. B, Comparison of structures between human TRIF, MyD88, and TIRAP/Mal. Domains were determined using the BLAST program. Length in amino acids is indicated. C, Detection of TRIF transcripts in human adult tissues. Multitissue Northern blot membrane (Clontech Laboratories, Palo Alto, CA) was hybridized with 32P-labeled probe of TRIF. PBL, peripheral blood leukocyte. As reported previously, ectopic expression of MyD88 and TIRAP significantly induced NF-κB activation in 293 cells as determined by the relative luciferase activity of the NF-κB-responsive promoter of the ELAM-1 gene (Fig. 2⇓A, left). Expression of TRIF also induced activation of the NF-κB-dependent promoter, albeit at low level compared with MyD88- or TIRAP-mediated induction. Because LPS (TLR4 ligand) and dsRNA (TLR3 ligand) are shown to induce expression of IFN-β in a MyD88-independent manner (5, 6, 7), we next examined activation of the IFN-β promoter using the promoter-driven luciferase reporter gene (Fig. 2⇓A, right). No promoter activation was observed when expression plasmid for MyD88 or TIRAP was introduced together with the reporter plasmid. However, expression of TRIF dramatically induced the IFN-β promoter activity. This result showed that TRIF is unique as a potent activator of the IFN-β promoter. TRIF activated the IFN-β promoter and NF-κB. A, 293 cells were transiently transfected with TRIF, MyD88, TIRAP, or empty vector (−), together with NF-κB luciferase reporter (left) or the IFN-β promoter luciferase reporter (right). Twenty-four hours after transfection, luciferase activity was measured. B, Schematic structures of TRIF deletion mutants (lower panel). 293 cells were transiently transfected with empty vector (−), full-length TRIF (full), TRIF lacking the N-terminal portion (ΔN) or the C-terminal portion (ΔC), or TRIF protein harboring only the TIR domain (ΔNΔC), together with NF-κB luciferase reporter (left) or the IFN-β promoter luciferase reporter (right). All of above data are representative of three independent experiments. To identify the domain essential for the promoter activation in TRIF protein, we generated several truncated forms of TRIF: ΔN, which encompasses the C-terminal half including the TIR domain (amino acid 380 to the C-terminal end); ΔC, which encompasses the N-terminal half including the TIR domain (amino acids 1 to 541); and ΔNΔC, which consists of the TIR domain only. When cotransfected with the NF-κB-responsive luciferase reporter, either ΔC or ΔN induced the luciferase activity, albeit reduced compared with full-length TRIF-mediated induction (Fig. 2⇑B, left). In the case of the IFN-β promoter-driven luciferase reporter, ΔC, but not ΔN, activated the promoter at the same level as full-length TRIF (Fig. 2⇑B, right). ΔNΔC did not activate the promoter activity of either luciferase reporter. These results showed that distinct domains of TRIF are responsible for activation of these two promoters: the N-terminal portion of TRIF is essential for activation of the IFN-β promoter activity, whereas both N-terminal and C-terminal portions of TRIF are involved in the NF-κB-dependent activation. Full-length TRIF-induced activation of both the NF-κB-dependent and the IFN-β promoters was significantly inhibited by coexpression of TRIFΔNΔC, showing that the TIR domain of TRIF acts as a dominant inhibitor like those of MyD88 and TIRAP (8, 9, 17) (Fig. 3⇓A). Using TRIFΔNΔC, we examined whether TRIF is involved in TLR-dependent signaling pathways. Expression of TLR4/MD-2 in 293 cells enabled the cells to activate the NF-κB-dependent reporter in response to LPS (Fig. 3⇓B). Coexpression of TRIFΔNΔC inhibited the TLR4-dependent activation of the NF-κB-dependent promoter. When 293 cells were ectopically expressed with TLR2 or TLR7, the cells showed NF-κB activation in response to mycoplasmal lipopeptide (MALP-2) or imidazoquinoline, respectively. The TLR2- and TLR7-dependent activation of the NF-κB-dependent promoter was prohibited by expression of TRIFΔNΔC (Fig. 3⇓, C and D). Ectopic expression of MyD88 and TIRAP resulted in a ligand-independent activation of the NF-κB reporter. 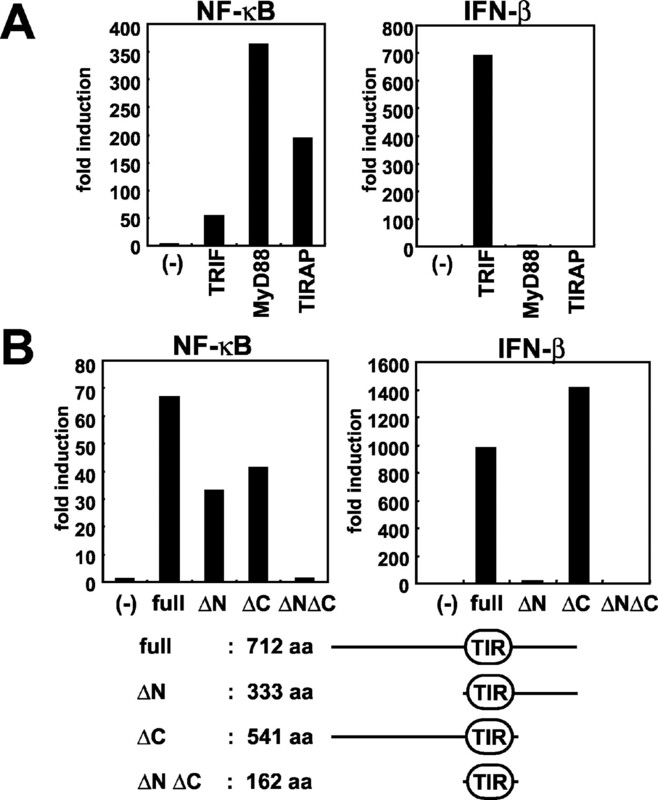 Coexpression of TRIFΔNΔC profoundly inhibited the NF-κB activity mediated by MyD88 and TIRAP (Fig. 3⇓E). These findings suggest that TRIF is involved in signaling pathways via multiple TLRs at the level downstream of MyD88 and TIRAP. DN TRIF inhibited NF-κB activation via several TLRs, and activation of the IFN-β promoter via TLR3. A, 293 cells were transfected with full-length TRIF plus empty vector (−) or TRIFΔNΔC, together with NF-κB luciferase reporter (left) or the IFN-β promoter luciferase reporter (right). Twenty-four hours after transfection, luciferase activity was analyzed. B–D, 293 cells were transfected with TLR4 plus MD-2 (B), TLR2 (C), TLR7 (D), together with NF-κB luciferase reporter and, where indicated, TRIFΔNΔC. Cells were then stimulated with 100 ng/ml LPS (B), 30 ng/ml MALP-2 (C), or 100 nM R-848 (D) for 12 h and NF-κB-induced luciferase activity was measured. E, 293 cells were transfected with MyD88 or TIRAP, together with NF-κB luciferase reporter and empty vector (−) or TRIFΔNΔC. F, 293 cells expressing human TLR3 were transfected with TIRAP DN or MyD88 DN, together with NF-κB reporter and, where indicated, TLR2. Luciferase activity of cells after stimulation with 50 μg/ml poly(I:C) or MALP-2 was measured. G, 293 cells expressing human TLR3 were transfected with TIRAP DN or MyD88 DN, together with the IFN-β promoter reporter. Luciferase activity of cells in response to poly(I:C) was measured. H and I, 293 cells stably expressing TLR3 were transfected with TRIFΔNΔC, together with NF-κB reporter (H) or the IFN-β reporter (I). Luciferase activity in cells treated with poly(I:C) is shown. Two independently isolated 293 cell clones that express human TLR3 were used for the experiments, and the same results were obtained. Compared with other TLR members, TLR3 uses a unique signaling pathway that induces IFN-β more predominantly than other inflammatory cytokines such as IL-12 and TNF-α (18). When 293 cells stably expressing TLR3 were transfected with the reporter plasmid and then stimulated with poly(I:C), both the NF-κB-dependent and the IFN-β promoters were activated (Fig. 3⇑, F and G). Although expression of DN forms of MyD88 and TIRAP inhibited TLR2-dependent activation of NF-κB, they did not inhibit the poly(I:C)-dependent activation of either the IFN-β promoter or the NF-κB-dependent ELAM-1 promoter, but enhanced activity of the NF-κB-dependent promoter (Fig. 3⇑, F and G). These findings indicate that TLR3 signaling mainly consists of the MyD88-independent pathway. As ectopic expression of TRIF led to preferential activation of the IFN-β promoter, we focused on the role of TRIF in TLR3 signaling. In sharp contrast to DN forms of MyD88 and TIRAP, TRIFΔNΔC inhibited poly(I:C)-dependent activation of both promoters in 293 cells stably expressing TLR3 (Fig. 3⇑, H and I). These results indicated that TRIF is involved in the MyD88-independent activation of TLR3 signaling. We next addressed association of TRIF with TLR3 and TLR2. 293 cells were transfected with Myc-tagged TRIF together with Flag-tagged TLR2 or TLR3. Myc-TRIF was coimmunoprecipitated with Flag-TLR2 and TLR3 (Fig. 4⇓A). The TIR domain of MyD88 and TIRAP was reportedly required for interaction with TLRs (8, 9, 17). We analyzed whether the TIR domain of TRIF (ΔNΔC) associates with TLR3 (Fig. 4⇓B). Myc-TRIFΔNΔC was coimmunoprecipitated with Flag-TLR3. These findings indicate that TRIF associates with TLR3 through the TIR domain and mediates the induction of IFN-β in response to poly(I:C). poly(I:C) and LPS stimulation has been shown to activate IRF-3 (6, 19, 20). Therefore, we next examined association of TRIF and IRF-3 (Fig. 4⇓C). 293 cells were transfected with Flag-tagged TRIF, and cell lysates were immunoprecipitated with anti-human IRF-3 Ab. Flag-TRIF was coimmunoprecipiated with IRF-3, indicating that TRIF interacts with IRF-3. Interaction of TRIF with TLR2, TLR3, and endogenous IRF-3. A, 293 cells were transiently transfected with Flag-TLR2, Flag-TLR3, and Myc-TRIF expression vectors. Thirty-six hours after transfection, cells were lysed, immunoprecipitated with anti-Flag Ab (IP), and then immunoblotted with anti-Flag or anti-Myc Ab (IB). B, 293 cells stably expressing Flag-TLR3 were transiently transfected with an empty vector (mock) or Myc-TRIFΔNΔC expression vector. Cell lysis, immunoprecipitation, and subsequent immunoblotting were performed as described in A. C, 293 cells were transiently transfected with Flag-GST or Flag-TRIF expression vector. Twenty-four hours later, cells were lysed, immunoprecipitated with anti-Flag Ab or anti-IRF-3 Ab, and then immunoblotted with anti-Flag Ab. Whole cell lysates (WCL) were immunoblotted by anti-IRF-3 Ab to detect endogenous (endo) IRF-3. In the present study, we have identified and characterized a novel adapter containing the TIR domain, named TRIF. Overexpression of TRIF activated the NF-κB responsive promoter of the ELAM-1 gene as well as the promoter of the IFN-β gene. Different from already published adapters such as MyD88 and TIRAP, TRIF activated the IFN-β promoter much more strongly than the NF-κB responsive promoter. Noteworthy is that a DN form of TRIF, but not MyD88 or TIRAP, completely abolished the TLR3-mediated signaling. This indicates a special role of TRIF in the TLR3 signaling. Furthermore, the DN form of TRIF blocked the NF-κB activity mediated by TLR2, TLR4, and TLR7, indicating some roles in other TLR signaling pathways. Although the functional role of TRIF in individual TLR responses should be examined through generation of knockout mice, the fact that TRIF preferentially activates the IFN-β promoter and TRIF associates with IRF-3 suggests the involvement of TRIF in the MyD88-independent pathway of TLR3 signaling. We thank Drs. Golenbock and Medzhitov for providing us with NF-κB reporter and expression vectors for TLR2 and TLR4, respectively. We also thank H. Sanjo, S. Uematsu, H. Hemmi, and T. Kaisho for helpful discussions, N. Okita for technical assistance, and E. Horita for secretarial assistance. 1 This work was supported by grants from Special Coordination Funds, the Ministry of Education, Culture, Sports, Science and Technology of Japan, and the Virtual Research Institute of Aging of Nippon Boehringer Ingelheim. 2 M.Y. and S.S. contributed equally to this work. 4 Abbreviations used in this paper: TLR, Toll-like receptor; MALP-2, macrophage-activating lipopeptide (2 kDa); poly(I:C), polyinosine-polycytidylic acid; IRF, IFN regulatory factor; TIR, Toll/IL-1 receptor; TIRAP, TIR domain-containing adapter protein; Mal, MyD88 adapter-like; TRIF, TIR domain-containing adapter inducing IFN-β; ELAM, endothelial cell-leukocyte adhesion molecule; DN, dominant negative. Yamamoto, M., S. Sato, H. Hemmi, H. Sanjo, S. Uematsu, T. Kaisho, K. Hoshino, O. Takeuchi, M. Kobayashi, T. Fujita, et al. Essential role of TIRAP/Mal for activation of the signaling cascade sharedby TLR2 and TLR4. Nature In press.